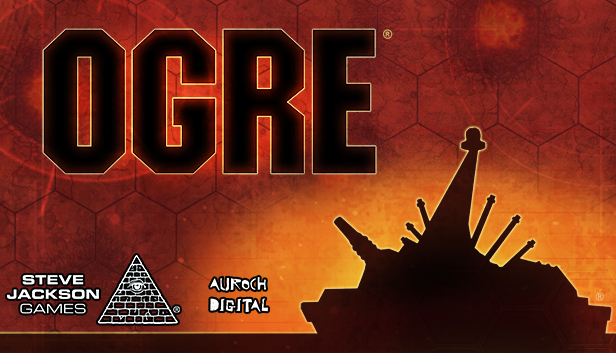 Ogre is a turn-based game of strategy which has been around in tabletop form for 40 years. It was first released in 1977 and has been updated with numerous editions since then. I've only been a boardgame fan for a couple of years now, so I didn't know much about Ogre going in to this review. I did take the time to check out the various tabletop versions, so that I would have an understanding of where this game was coming from. From what I've gathered, this is a very faithful rendition of the classic Ogre boardgame, which is great for fans. At the same time, Ogre suffers a bit from the double edged sword which is strict boardgame-to-PC adaptations. However, any game which remains popular over the span of four decades has certainly got something going for it, regardless of how you are playing it. Ogre succeeds unequivocally in one aspect, which is the presentation of playing a boardgame in a digital medium. The visuals are simple and clean, while giving the distinct feeling that you are looking at a hex-map covered in models, all set up nicely on a table. The game runs buttery smooth, which isn't surprising given the level of detail, but does make the presentation all the better. You want to feel like you are looking over a boardgame table, and smooth camera movement is key to that. While the units only have limited animations, they are adequate for the job, accompanied by equally simple explosions and other effects. The sound effects were rather less impressive, with most being extremely repetitive. On the other hand, I found the music to be surprisingly good for this kind of game. It's not Command & Conquer, but there are some decent techno/rock type of tracks to give the game some ambiance while you play. Ogre, according to the lore, depicts a futuristic world where humanity does battle with each other using tactical nukes as the standard weaponry. This is because armor has advanced so rapidly that nothing else can make a dent. Even the armored soldiers are closer to nuke launching tanks than infantry, Starship Troopers style (the book, not movie). Deciding that wasn't enough death and destruction, the humans of this world invented the Ogre, an armored machine bristling with enough weapons to destroy a city or three, and piloted by an AI. As you might guess, the story of the game involves that AI going all Skynet and attempting to wipe out humans for good. While the game features a variety of armored units for the human forces, like light/heavy/super heavy tanks, long range artillery, fast GEV's, and infantry, the Ogres completely dominate the battlefield and shape the gameplay. An Ogre can only be disabled by knocking out their dozens of tracks and each individual weapon, rather than being destroyed outright. The Ogre comes in a series of models, from I to VI, with the relatively small Model I Ogres requiring a dozen units or so to defeat, and the big bad versions able to take on entire armies alone. This creates a stark strategic difference between the Ogre and everything else on the battlefield: most of the other units can only fire once per turn, but their sheer numbers give them flexibility of movement, while the Ogre is often alone, but able to engage many targets at once. Combat follows a set series of phases, where the player gets a chance to move and attack, and then the other side goes. Maneuvering around the Ogres, such that your units can get close enough to attack, while maximizing their chances of surviving the opponent's turn, is at the center of the game's strategy. The game seems extremely simple at first glance, but there is much more subtlety to the tactics than may first appear. I actually had to research some common strategies just to get through the first mission, but once I had a better understanding of the mechanics, a mission which seemed impossible became far easier. That isn't to say that the game throws you in blindly. There is a solid tutorial to start things off, where you learn about moving and attacking and so on. However, after that the ten mission campaign drops you straight into the deep end of the pool. If you are like me, several attempts will be needed for each mission before a winning strategy emerges. In particular, I enjoyed stacking my forces with the quick GEV's, since they get to move again after firing. This lets them zip in, take a shot at an Ogre, then flee out of range of its wrath. The UI for handling all of this moving and attacking is mixed bag. On the one hand, it is perfectly functional and clear about what you are doing. Click to select a unit, click a highlighted space to move, click to select a target, select the units you are using for the attack, click "Fire" to attack, and so on. The problem is that you are very often moving around quite a few units, and each one requires this slightly too lengthy series of clicks to function each turn. The movement animations are also a touch too slow, and you can't do anything else while they play. This makes moving a stack of five tanks from one space to another a real chore. If you were playing the tabletop game, you could just pick up a whole pile of units and, assuming they are all the same type, move them to another space in the blink of an eye. In the PC game, this could take a good thirty or forty-five seconds of clicking. The developers have been steadily sending out patches to address feedback, and I hope they will add in some means of speeding up this area of the game. The combat, while for the most part compelling, had some stumbles for me as well. There is a lot of good strategy here. How you position your units, what priorities you set for targets, and the composition of your force all matter a great deal. More than once I lost a mission and felt frustrated, but then immediately jumped back in with the thought "Well, what if I did it this way instead?" From what I've learned on my own, and gleaned from reading online, there is no one-size-fits-all strategy here. The simple question of "How does one kill an Ogre?" has all sorts of answers. With that said, the boardgame origins of the combat mechanics don't always feel right in video game form. Rolling the dice always introduces luck into a game like this, and you will see a lot of dice rolled in Ogre. Part of the strategy is balancing the odds. Do you go all in on one sure-thing attack, or do you make several lesser attacks, with the chance of destroying multiple targets? One aspect of the combat which drove me crazy though, was taking out the treads on an Ogre. Unlike the weapons on an Ogre, the treads are targeted by each unit individually, with a rather low chance to hit, and there are a LOT of them to destroy. Sometimes this boils down to watching fifteen units pew-pew at a weaponless Ogre for multiple turns in a row, slowly grinding away the treads until you win or run out of time, with no skill involved whatsoever. I'm sure a long time fan of the game could jump in here and tell me that I'm approaching it incorrectly, and they might be right! If you want to flip things around and take command of the Ogre yourself, that is certainly possible. Besides the campaign, the game features skirmish maps which include several different generic scenarios. Some are balanced, while others involve lopsided forces, like a human army and a small Ogre defending against an extra dangerous class V Ogre. While the AI is decent enough, and will give you fits in the tricky campaign, there is of course the option of online play against a human opponent, the sort of match that Ogre was originally designed for. I didn't get to experience this myself while playing the game for review, but it seems to be functioning based on reports from other players. It feels almost wrong to render any kind of verdict on a game that is been enjoyed by thousands of players longer than I have been alive, especially after only spending a week or so with it, but here we are. Ogre will most certainly please fans of the tabletop game. Everything is here, presented in a very clean and functional digital wrapping. There's online play for beating up your distant friends, and a couple of modes for solo play that will keep you busy for many hours. For players coming into it strictly as a PC game, it may feel constrained in some ways. The luck of the dice which can turn the best laid plan on its head, and the at times clunky UI could drag down your experience. Despite those criticisms, there is a very solid core of strategy gaming to be found here. New tactical layers reveal themselves as you get familiar with the mechanics, and usually reward your improved approach with much better results. I think any fan of turn-based strategy gaming will find something here to sink their teeth into. As an Ogre fan from the tabletop, I have to say your comment about grinding away treads is quite accurate, if maybe a little unfair. The final marathon to stop the ogre isn't necessarily skill-free. The maneuvering to keep your units in range to hit the Ogre, preferably without getting too many of them killed by guns or treads (and fully disarming the ogre before going for the kill is not typically a winning strategy against a good player) can be interesting. But it often does reach a point where it isn't, and the Ogre is simply crawling toward the CP and hoping the dice allow it to endure long enough. That's Ogre's manifestation of the endgame problem common in strategy games, where the most decisive choices are the ones made early in play, and the late game takes on an aspect of laboriously deriving the conclusion that follows from that, rather than being interesting in its own right.